A HD screen, forward facing flash and stereo speakers give the Acer Liquid E3 a decent spec list, but really poor call quality and an old OS leave this handset lagging behind its closest rivals. 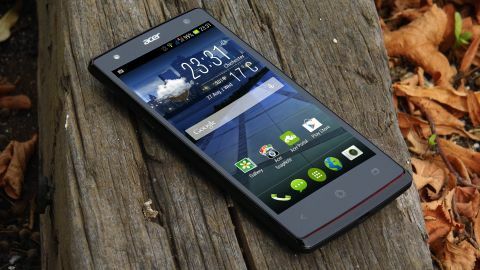 Acer isn't a manufacturer that you'd typically associate with mobile phones, despite having numerous handsets under its belt. With this experience, Acer is hoping to make a success out of its latest mid range offering, the Liquid E3. A quick look down the spec sheet leaves little doubt where the Liquid E3 is going to be pitched, coming with a 4.7-inch 720p screen, a MediaTek quad-core 1.2GHz CPU and 1GB RAM this is certainly not going to set the world alight. Elsewhere there is a 13MP rear camera and a 2MP front sensor, which interestingly both come with flash, as well as 4GB of internal space to store all your snaps. Thankfully the Liquid E3 does come with microSD support. But how much does all of this cost? Signing up to a two year contract will get you the Liquid E3 from as little as £14pm (around $23, AU$26) or SIM free from £128 (around $210, AU$237). This means that the Acer is going head-to-head with the new Nokia Lumia 635, the Moto G and the HTC Desire 610. Even older flagships such as the Samsung Galaxy S3 occupy this end of the market, and I wouldn't be surprised if the Sony Xperia M2 Aqua came in with a very competitive price tag. There is definitely a fight to be had here. Measuring in at 136 x 68 x 9mm (5.35 x 2.68 x 0.35 in), the Liquid E3 is by no means the smallest handset in the world, but at 134g (4.73 oz) it is not the heaviest. This lightness is thanks to the (non removable) plastic casing which fits in perfectly with the budget price tag. The size did mean that I had a little trouble hitting all aspects of the screen one handed, but this never proved to be a problem. Other than size, resolution is the big factor that comes into play when talking about mobile screens, and I am pleased to say that the Liquid E3 is not a let down. Of course the same pop and sparkle that graces the full HD screens of mobile flagships was missing, but the Liquid E3 certainly gives the Moto G a run for its money at this level. Fans of the HTC One series might be pleased to hear that the Liquid E3 employs a similar stereo speaker set up, with the speakers set back in stylish metallic red. Despite the cool colours, I really didn't like the design as they are set back from the screen, making it feel like the glass display doesn't fit the rest of the handset. These speakers are backed up by DTS Studio Sound though, so the sound quality should be pretty good. In terms of other key features, the Liquid E3 comes with a microUSB port at the base for connecting to a PC and charging. The volume rocker and covered microSD slot are on the right, with the covered microSIM slot on the left and headphone port on the top alongside the power/lock key. The Liquid E3 also employs the use of capacitive keys rather than Android's on screen wares, something that I am still undecided on. I like having dedicated keys but the Liquid E3 could have benefitted from being that little bit smaller.